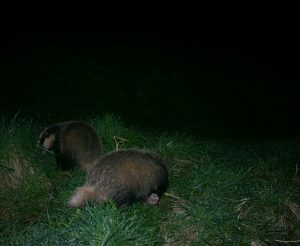 Two badger cubs with their mother came out of the sett last night, full of mischief causing their mother a few problems. The roe buck was feeding just a few feet from the sett entrance where they came out from. One of the cubs never seeing a deer before went to investigate, nearly touching noses. The deer didn’t bother with it for a little while but it soon got bored with the cubs antics. It threw its head sideways causing the cub to leg it back to mum, leaving the buck to carry on feeding. The cub went back again, this time the buck was having none of it and with its head catching the cub with its antlers causing it to roll over. It did look for an instant that the cub had been injured. 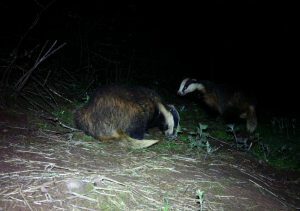 Back with its mother under protest this time she decided to get them back into the sett. 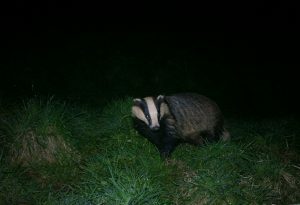 No way they must have been thinking, as she was pushing them in they were struggling to get out of the sett entrance. 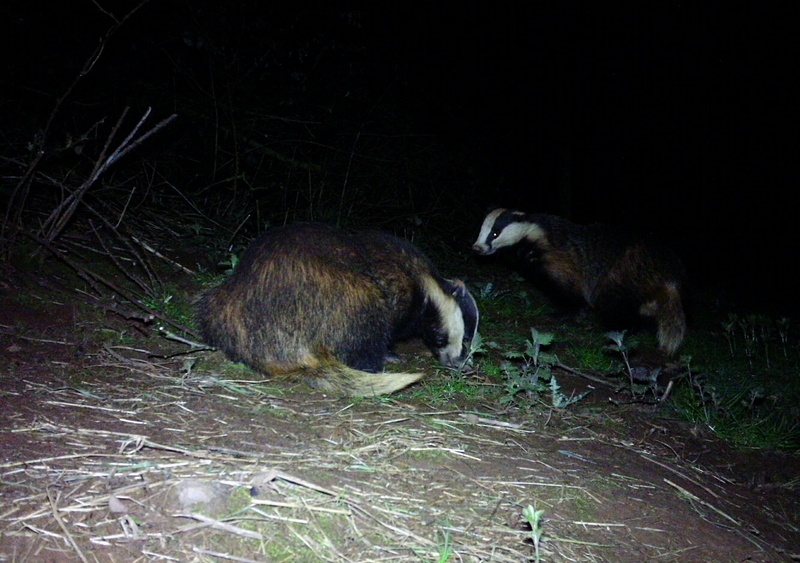 Finally she got them both back into the sett for a few minutes. 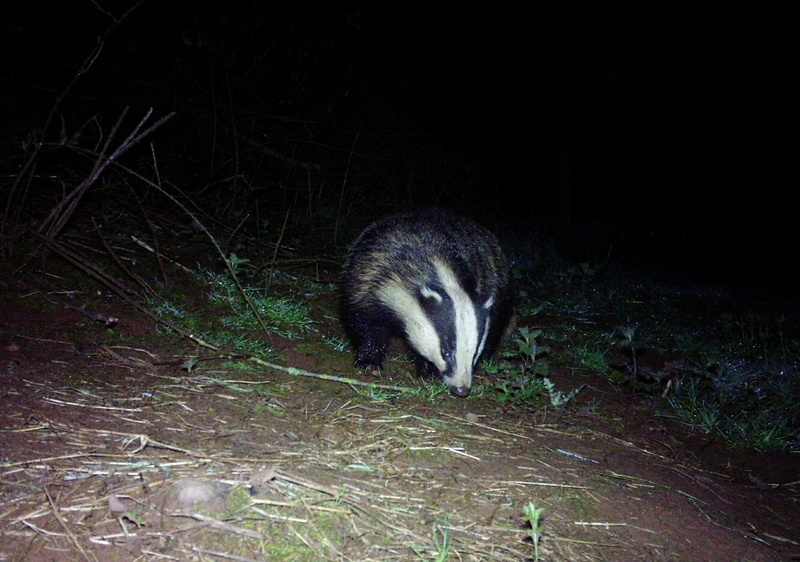 I reckon whilst back in the sett the two cubs were conspiring against the deer, for once they were out the two of them rushed toward the buck making him to leg it away. We didn’t see the buck any more last night. After over 15 years we never get bored with watching the webcams. 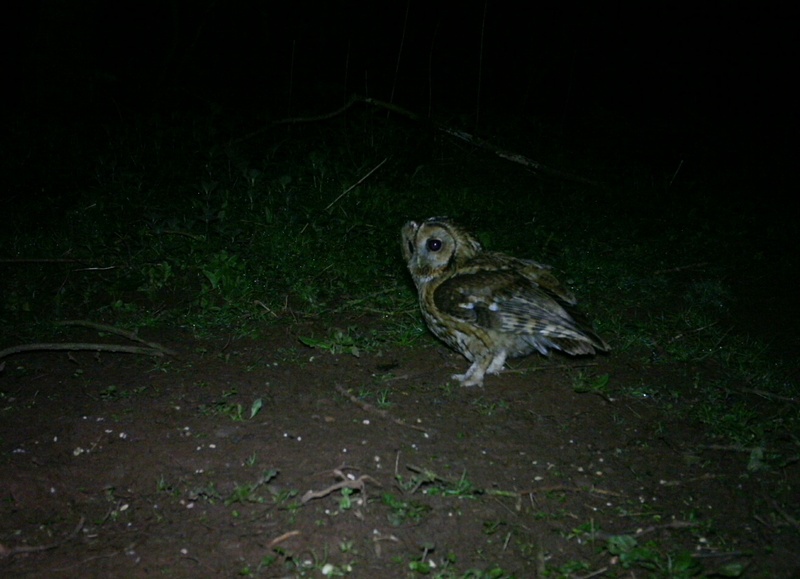 Other than short periods in winter time there is always something happening This spring the feeding area has been particularly busy and exciting. 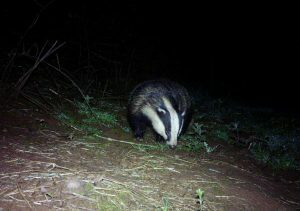 As many as four deer at any one time, one or two feeding at the same time as a couple of the badgers. The vixen tries to sneak in for a little feed, she is defiantly at the bottom of the pecking order with both the deer and the badgers chasing her off. In saying a couple times this week one of the badgers has been feeding with the vixen. From a distance last week I thought I saw a couple of fox cubs in the edge of the wood investigating whatever they investigate at that age. 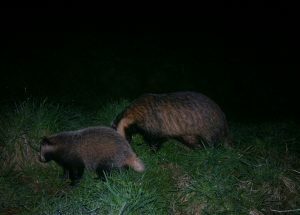 It needs to get a bit warmer, then fox cubs will be out a lot more and playing. Although at a distance from us but well within our sight, with the vixen watching close by knowing we are there but of no danger to them. Its going to be an eyeful when the fox cubs visit the already busy feeding area. We have two pair of Geese nesting this year. Our regulars on the larger lake and a new pair on our new lake. The new pair had to work hard to convince the swan to accept them, but grudgingly and still bickering a little they have managed to start nesting. At last today we have seen a whole day of warm sun. It hasn’t stopped raining for the past 3 months, so today was not expected. On nearly 30years It’s been by far the wettest winter we have ever experienced at Denbury. The fields are sodden and for sure the horses won’t be going out on the first of May as usual. It far too wet. For the first time for many years we made haylage at the beginning of Autumn last year. (hay not quite dry and wrapped in a poly rap) Just as well we did as today we were down to our last three bales of hay, a little over a week’s supply. Our contractor got the haylage in off of the field. After a few months on hay it is a treat as you can see on the webcam they are enjoying it. It should get us though until the second week of May.